Couture Creations IRIDESCENT FLAKES PINK Heat Activated Foil co726048 at Simon Says STAMP! co726048 This item is on reserve until If you would like to reserve this item now, you may purchase it now with the rest of your order. We will hold your order now and ship your entire order as soon as this item is back into stock. If you would like your order to ship now, please place this item on a separate order. Success, Couture Creations IRIDESCENT FLAKES PINK Heat Activated Foil co726048 has been shared! Use to foil chipboard, cardstock, ribbon and more! Use with the GoPress & Foil Machine (sold separately). This package contains 16.4 feet of 4.75 inch wide foil. Comes in a variety of colors. Each sold separately. Imported. Couture Creations is the home of high quality, stunning products designed by enthusiasts and experts for the scrapbooking, cardmaking and craft industry. 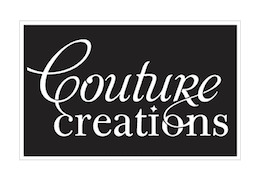 Couture Creations is an Artdeco Creations brand that excels with their craft tools and accessories that every crafter needs!